That's sounds more like "we are sure we are not going to export" Model 3 forever. 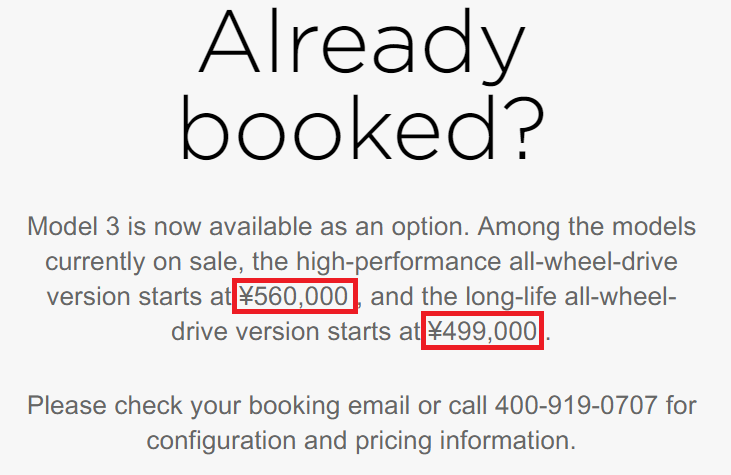 Tesla has updated its Model 3 pricing for China and the dual motor editions which are expected to be available in late Q1 or early Q2-2019 are priced at unbelievable rates. The Performance edition will start at 560,000 Yuan($81,195), while the long-range dual motor edition starts at 499,000 Yuan ($72,351). The pricing clearly shows that Tesla has found some way to get rid of or minimize the impact of 15% duty that’s slapped on cars imported into the country. Tesla has priced Performance Model 3 a full $26,000 less than Model S starting price in China and just $3,000 more than what it costs in the United States before savings. The Model S base version costs 742,000 Yuan ($107,584), compared to $65,000 in the United States (after accounting US federal tax credit of $7,500). 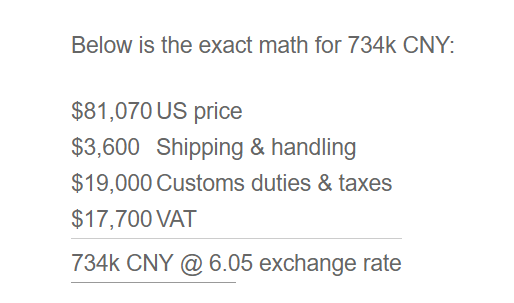 The Model S costs so much in China, because on top of the import duty, there is 17% VAT and then there is an estimated $3,600 shipping charge per car. In 2014, Tesla gave us a detailed breakdown of Model S pricing in China. For Chinese customers, the price of the Model S with the premium 85 kWh battery pack is 734k CNY. The price of a Model S in China is much lower than its competitors simply because we want to treat our Chinese customers just as well as we’d treat customers in any other country. 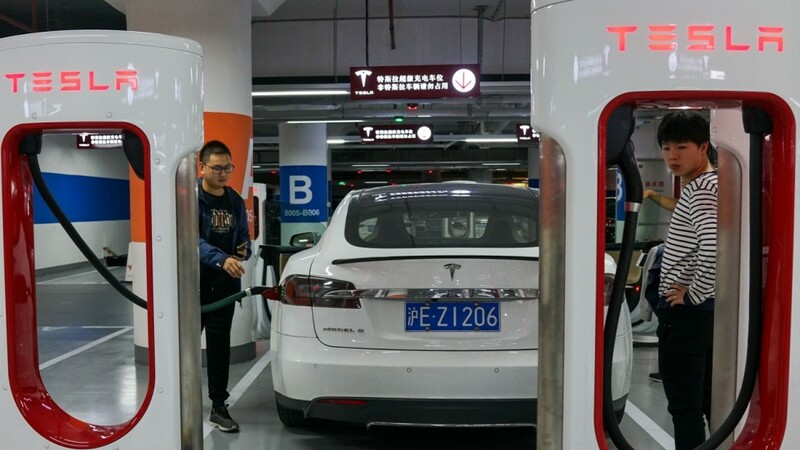 That means the price of a Model S in China is the same as the price of a Model S in the US, adding only unavoidable taxes, customs duties and transportation costs. There are only two ways this could have happened. Either Tesla has got the duty waived/reduced on Model 3 and or the company has got some form of EV incentive to help slash Model 3 cost. China recently announced that it will cut tariffs on ” US-made cars to 15%, the same tax levied on car imports from other countries”. The recent announcement to roll back tariff would have certainly helped Tesla to reduce Model 3 price, but at 15%, it’s a significant number because we still need to add VAT and shipping charges. According to Tesla CEO Elon Musk, Model 3 deliveries to China will begin in March or April 2019. 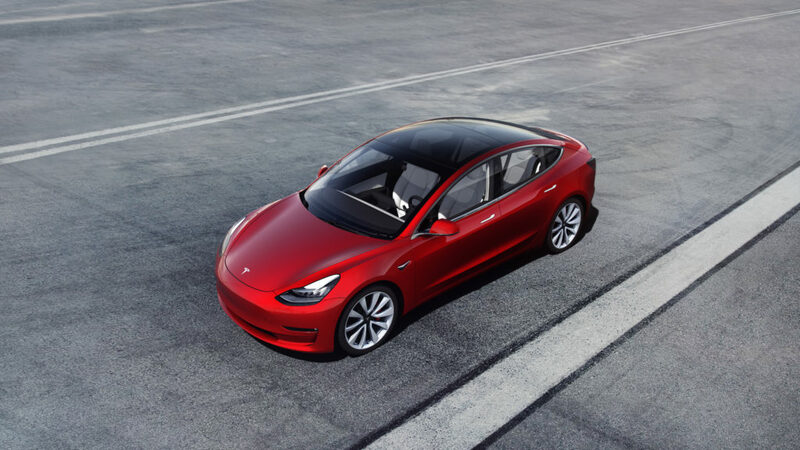 Though Tesla is planning to start building Model 3 in China in the second half of 2019, it will be way too early for the company to take advantage of local production as deliveries are expected to begin in March or April. What will be the impact of Model 3 Pricing on sales in China? Tesla has followed a similar strategy that it uses in the United States to price Model 3 variants in China. In the United States, the Performance edition starts at $64,000, Dual Motor all-wheel drive starts at $53,000 and the Mid Range rear-wheel drive model starts at $46,000. A $11,000 price difference between the top two variants and a $7,000 price difference between the bottom two. The price difference between the top two variants in China is almost $9,000. We can expect the mid-range to be launched around $63,000. The Model 3 price stretch will be from $63k to $87k in China. Though the (expected)Mid-Range and Dual Motor Model 3 price will position them a little above BMW 5 series and Mercedes E Class, the Performance edition undercuts BMW M3 and AMG E 43 by a wide margin. Data from Carsalesbase* shows that BMW sold a massive 120,320 BMW 5 series in China last year, while Mercedes Benz E Class followed closely with sales of 113,431 units. Both the German car makers are selling nearly 10k units each (5 series and E class) every month. Market for the mid-size premium luxury sedan is huge and Tesla Model 3s demand has to be in the order of thousands of units every month in China. Demand in China should far outstrip Tesla’s supply capacity in 2019 and maybe even beyond. Carsalesbase sales statistics from China only include domestic production and exclude imported models.